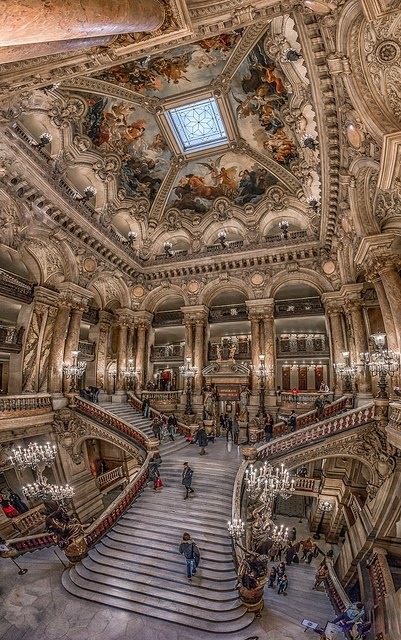 The Palais Garnier is a building of exceptional opulence. The style is monumental and considered typically Beaux-Arts, with use of axial symmetry in plan, and its exterior ornamentation. Its audience sits under a central chandelier which weighs more than six tons, and it has a huge stage with room to accommodate as many as 450 artists. It is decorated with very elaborate multicolored marble friezes, columns, and lavish statuary, many of which portray deities of Greek mythology. Gilded galvanoplastic bronze busts of many of the great composers are located between the columns of the theatre's front façade and depict from left to right: Rossini, Auber, Beethoven, Mozart, Spontini, Meyerbeer, and Halévy. On the left and right lateral returns of the front facade are busts of the librettists Eugène Scribe and Philippe Quinault, respectively.